Advocate Om Sharma, one of the three lawyers evading arrest for allegedly instigating attacks on journalists and students in the Patiala House Court (PHC) premises, was arrested on Saturday and released on bail later, after he appeared at the Tilak Marg Police station. The accused lawyer, identified as Om Sharma, presented himself for interrogation at Tilak Marg police station, where he was arrested under relevant sections of IPC and was later released on bail, Deputy Commissioner of Police (New Delhi) Jatin Narwal said. “He was booked under sections 147 (rioting), 149 (unlawful assembly), 323 (causing hurt) and 427 (causing damage to property) of the IPC,” he added. Police said Sharma was questioned till 6.30 pm. “He was then arrested and released on bail at 7.30 pm. During questioning, he rejected allegations of beating up journalists and claimed the journalists got into a scuffle with the students,” said a senior police officer. The Hindu reports that he was asked about Mr. Chauhan and Mr. Singh as well as his own role in the incident. Besides Mr Sharma, two other lawyers, identified as Vikram Singh Chauhan and Yashpal Singh, were issued notice by police thrice asking them to join interrogation between Wednesday and Friday.While Mr Sharma was arrested today, the others are yet to join investigation.If they fail to join, the police are likely to move court seeking warrant against them in the coming week, a senior official said. On February 15, a group of men dressed in black robes, allegedly led by the trio, had attacked journalists, students and teachers of JNU at Patiala House Court where JNUSU president Kanhaiya Kumar was produced. Two FIRs were registered in connection with the incident and earlier this week BJP legislator OP Sharma, who was caught on camera assaulting a CPI activist on the same day, was arrested too. 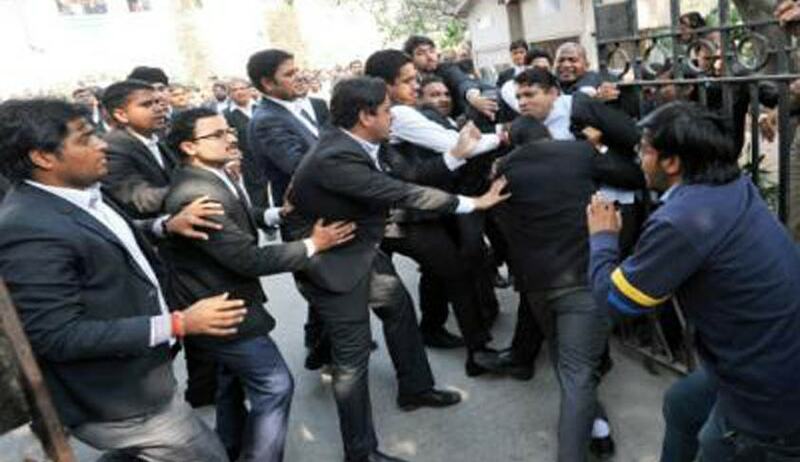 On February 17, defying instructions of the Supreme Court, groups of men dressed like lawyers, led by Chauhan, unleashed another attack on journalists and Kanhaiya Kumar when he was produced at Patiala House Court at the end of his police custody.Following that incident, two fresh cases were registered by police. Meanwhile a journalist-friend of the JNU student Umar Khalid was questioned for nearly six hours by the Delhi police on Saturday. Umar has been accused of raising anti-India slogans on the campus at an event on February 9.Journalist Sadiq Naqvi, who was one of the persons Umar had spoken to after the event and before he went missing, was made to answer an extensive questionnaire. He has been asked to visit the police station again on Sunday. He arrived at the Vasant Vihar police station around 11 a.m. and was quizzed by the STF officers as well as the officers from Vasant Kunj police station where the sedition case against Umar has been registered.Deputy Commissioner of Police South District Prem Nath also stayed at the STF office for a brief while and questioned Sadiq. “He was asked about Umar’s whereabouts, something Sadiq replied that he was not aware of. He did accept that he had spoken to Umar some 10 days ago and has not been in touch ever since,” said a police source. The source added that Sadiq was further asked about the possible hideouts of Umar and the history between the two. He was further asked about the event commemorating the third anniversary of Afzal Guru’s hanging and whether he himself was a part of the event.